Years ago, after reading Julia Cameron's The Artist's Way, I decided to incorporate her suggestion to schedule a weekly Artist Date into my writing practice. The date is to explore something that interests you. It can be as simple as browsing in a second hand shop, taking a walk in an old neighborhood to look at the architecture, visiting a public park, or visiting a museum exhibit. 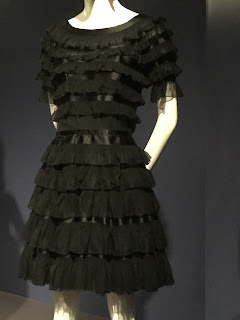 This week's Artist Date found me traveling down I-75 to the Cincinnati Museum of Art to see the exhibit High Style: Twentieth-Century Masterworks from the Brooklyn Museum Costume Collection. One of my friends studied home economics in college and her coursework included classes on fashion design and couture. 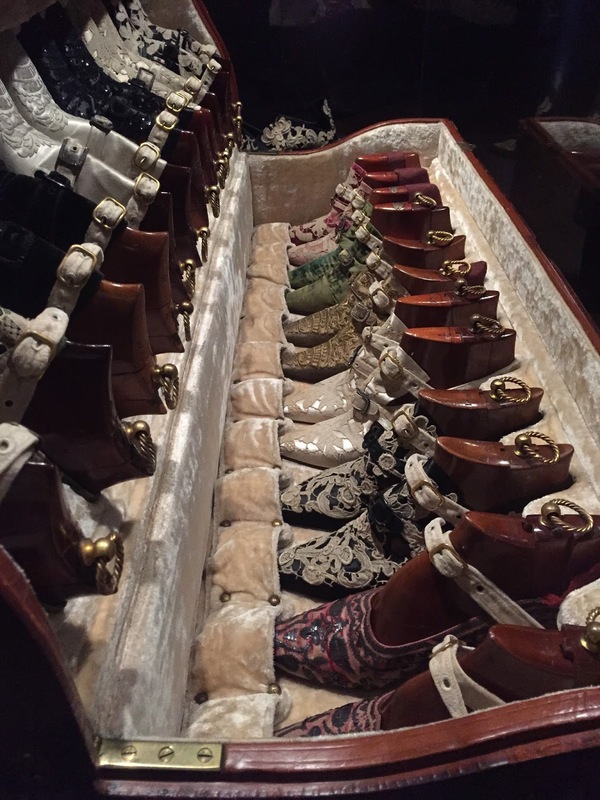 She said that this show was a rare opportunity to see clothing, jewelry, and shoes from some of the world's top designers. 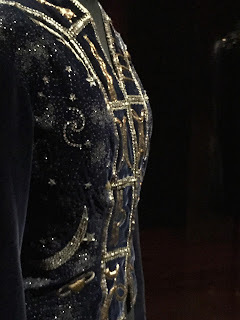 I loved the exhibit, especially a jacket designed by Elaine Schiaparelli (1890-1973) of deep blue velvet and covered with celestial symbols, astromonical and astrological. The exhibit card stated she was influenced by an uncle who was an astronomer and she used celestial iconography in several of her collections. As I a little girl I loved finding the big dipper in the night sky. This jacket has the big dipper over the left shoulder. The lapels have stylized astrological signs. There are comets and galaxies and star bursts everywhere. It is whimsical and gorgeous. We have all talked about every woman needing an LBD, little black dress, and they had one by none other than Coco Channel. There was a series of dresses that looked familiar becasue I have seen the cast of Downton Abbey similarly attired. There were incredible shoes and a wooden travel case designed to transport them safely. How does this kind of Artist Date fuel my writing practice? Well, I wrote two poems while there. I jotted down an idea for a short story based on those shoes. I took plenty of photos to use as writing prompts. And I immediately decided which character in my novel is going to wear a jacket she makes after being inspired by Schiaparelli. Reading the museum notes gave me insight into the creative processes of the designers, also fodder for character creation and development. Then there was the added joy of witnessing my friend's bliss. Passion fuels passion. The muse was pleased.